Insects that change from egg to larva to pupa to adult -- a process called complete metamorphosis -- often build protective cocoons. Insects spin cocoons to provide protection for the vulnerable pupal stage of development, when insects undergo their transformation to their adult stages. A wide variety of insects build cocoons, and cocoons come in a wide variety of shapes, colors and materials. Butterflies are perhaps the most well-known cocoon-encasing insects. When butterflies transform from their larval caterpillar stage to the pupal stage, they will create hard, solid, hanging cocoons called chrysalises or chrysalides. Chrysalises form around the body of the butterfly pupae and hang from twigs, leaves or other structures by silken threads or disks. These cocoons house the butterflies as their bodies rearrange into adult form. Like butterflies, moths begin their larval stage as caterpillars and enclose their pupae in cocoons, though their cocoons are distinctly different. Moths form several kinds of cocoons, but most are spun of silk and completely enclose the insects. Some caterpillars, like the woolly bear larvae of the Isabella tiger moth, simply use their silk to bind their hairs together into a protective covering. 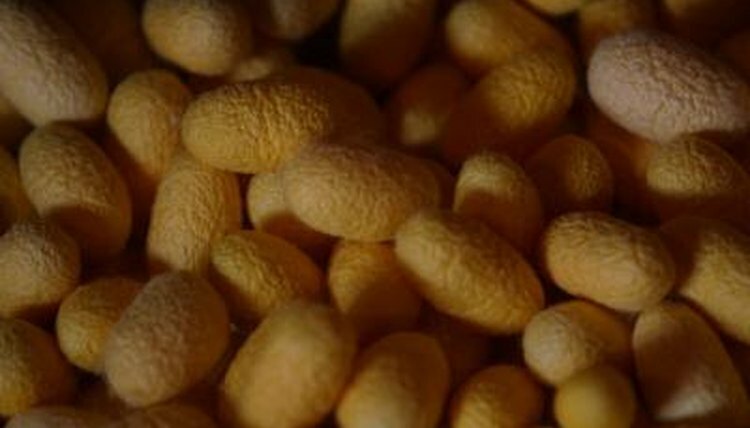 Moth silk used in cocoons can be valuable to humans, too, as in the case of the silkworm, whose silk is used to make silk textiles. Bees and wasps create cocoons in the vulnerable pupal stage, as well. The familiar honeycombs of honeybees are composed of individual cells where young bees will live until they reach adulthood, cared for by workers as they develop. During the pupal stage, they spin cocoons within their cells to develop into adults. The celled nests of wasps function in a similar way, with pupae enveloping themselves in cocoons within the cells of the nest. Some wasp species, like the grass-carrying wasp, use found materials like grass blades to create individual cocoons. Countless other species of insects build cocoons, including insects that might not immediately come to mind as cocoon-spinners. Fleas and ants, for example, build cocoons during their pupal stage. In the case of ants, adult worker ants are tasked with the care of many individual cocoons. Other insects make use of materials around them to create secure cocoons in which to pupate. Ant lion larvae will make use of grains of sand to embellish their cocoons, and insects that pupate underground will often incorporate earth into their cocoons.